Need help installing native Winstep themes and Nexus 3rd party dock skins? Winstep themes come in one of two formats: as zip files or self-installable .xtreme files. In the later case, all you have to do to install the new theme is double click the .xtreme file - the new theme will be automatically added to the list of available themes. Unfortunately things get a bit more complicated if the theme is still using the older .zip file format (the .xtreme theme format is still fairly recent). To know what to do with it, you will first have to open the zip file and look at its contents. This is because theme authors are the ones who ultimately decide what is actually inside the zip file: sometimes a single zip file will even hold several variations of the same theme. When you open the theme zip file, you will usually see one of two things: either one or more folders (this is where things get more complicated) or a bunch of bitmaps and configuration files. In the later case, installing the theme is relatively easy: open the Themes tab in Preferences, click on the Import button, navigate to where you've saved the downloaded zip file and double click it. The contents of the zip file will be automatically imported and the new theme should appear in the list of available themes (try refreshing the Themes page in Preferences if it does not). Open the My Documents folder. Inside the My Documents folder you will find a shortcut to the Winstep user data folder. Double click the shortcut to open that folder. Inside the Winstep user data folder you should see a folder called 'Themes'. Now drag all the folders inside the zip file into the Themes folder. Everything having gone well, all you need to do to see the new theme is refresh the list of themes by re-opening the Themes tab in Preferences. Nexus is compatible with ObjectDock, RocketDock, RK Launcher, MobyDock and Y'z Dock dock skins. To import non-native Nexus skins (which are all inside the zip files) open the Themes tab in Preferences, click on the Import button, navigate to where you've saved the downloaded zip file and double click it. Although non-native themes are stored in a separate location, Nexus should automatically distinguish between native and non-native themes and store them in their appropriate locations (otherwise it will just prompt you for clarification). To locate the folder where Nexus stores 3rd party skins, open the My Documents folder. Inside the My Documents folder you will find a shortcut to the Winstep user data folder. Double click the shortcut to open that folder. Inside the Winstep user data folder you should see a folder called 'Nexus'. Open that folder and you should now see two more folders: 'Backgrounds' and 'Tiles'. 3rd party skins are stored inside the Backgrounds folder. Nexus and Winstep Xtreme allow you to download several different themes and then install them all at once. In order to do this you should save your downloaded themes into the Winstep AutoInstall folder. To locate this folder, open the My Documents folder. Inside the My Documents folder you will find a shortcut to the Winstep user data folder. Double click the shortcut to open that folder. Inside the Winstep user data folder you should see a folder called 'AutoInstall'. Any zip or Xtreme theme files that you place there will be automatically installed when you click on the Import button or when Nexus/Winstep Xtreme are started. WARNING: Note that all zip and xtreme files stored in the AutoInstall folder will be automatically deleted after installation! 3rd party dock themes only skin dock backgrounds, which is all we need in the free version of Nexus. Nexus Ultimate, on the other hand, besides supporting multiple docks also features the Shelf (tabbed dock), and Winstep Xtreme adds Desktop Modules, menus, a customized taskbar, etc..., to the mix. As such, only native Winstep themes will skin all those objects. 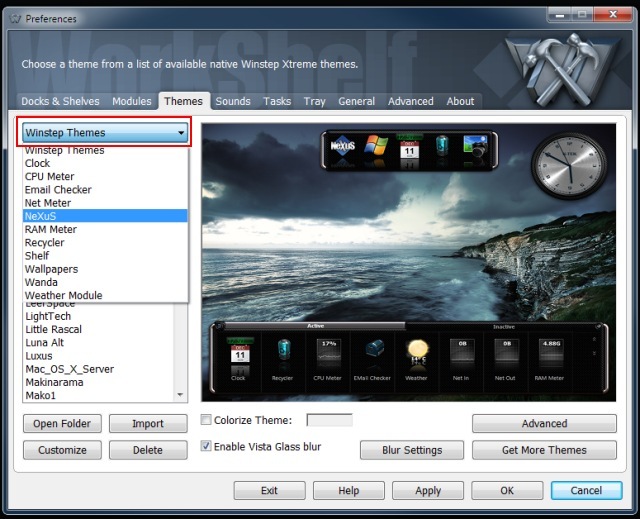 The Themes tab in Nexus Ultimate or Winstep Xtreme Preferences only lists native Winstep themes by default. If this were not so, users would select a new theme and then wonder why only the docks changed their look (3rd party dock themes do not have the bitmaps required to skin all the different objects in Nexus Ultimate and Winstep Xtreme). The combo box at the top left of the Themes tab allows you to select which objects you want to apply a particular theme to. If you switch from 'Winstep Themes' to 'Nexus' in that combo box, then all available Nexus themes will be listed, including any 3rd party dock themes you have installed. So, selecting an object from the combo box means that all themes available for that object will be listed AND that only that particular type of object will be affected if you then apply one of those themes: select Nexus in the combo box, apply one of the available Nexus themes and only the docks will assume the new look - the Shelf, for instance, will retain the previous theme. This feature is so powerful that it allows you to, for instance, combine different 3rd party dock themes with native Winstep themes (select a native Winstep theme, apply it, select Nexus in the combo box, chose a 3rd party dock theme, apply it - now only the docks will display the selected 3rd party dock theme, all other objects retaining the native Winstep theme you have previously applied). One final trick: applying themes on the Themes tab of Nexus Ultimate or Winstep Xtreme Preferences will apply that same theme to all your docks. If you want to change the theme of a single dock (for instance, you have multiple docks and you want each dock to have a different theme) you can still do that through the Themes tab in the Dock Properties panel of each dock.